Help your child avoid orthodontic problems with early treatment at both our Sudbury orthodontics and Mississauga orthodontics offices. 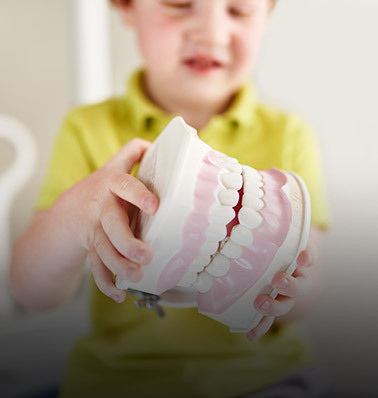 While many children don’t need treatment earlier on, some problems are better treated at a young age to avoid costly or invasive procedures in the future, such as extraction of adult teeth or surgical treatment. The American Association of Orthodontists recommends having your child’s first orthodontic check-up by age 7 to address subtle problems with jaw growth and emerging permanent teeth. We do not recommend any treatment unless it is absolutely necessary. Dr. Virdee is the leading kids orthodontist in Mississauga and in Sudbury. We place special emphasis on early orthodontic care and work to provide exceptional dental experiences for our youngest patients so that they can LIVE, LAUGH, SMILE during their most important stages in their development. Early orthodontic treatment in children is used to help with growth of the jaws and minimize the chance of extraction of permanent teeth or invasive treatment in the future. Check out how we helped to give kids healthy, confident smiles!